So I got this idea of summarizing plots in TV shows/cartoons/anime in short (and perhaps funny) sentence or phrase. It may not sound accurate, but that’s what makes it fun. PLOT: The series is set in the fictional Beach City on the Delmarva Peninsula on the American East Coast, where the Crystal Gems live in an ancient beachside temple, protecting humanity from monsters and other threats. Ageless alien warriors, they project feminine humanoid forms from magical gemstones that are the core of their being. The Crystal Gems are Garnet, Amethyst, Pearl and Steven, a young half-human, half-Gem boy who inherited his gemstone from his mother, the Crystal Gems’ past leader Rose Quartz. As Steven tries to figure out his gradually expanding range of powers, he spends his days with his human father Greg, his friend Connie, the other people in Beach City, or the Gems. He explores the abilities passed down to him by his mother, which include fusion—the ability of Gems to merge their bodies and abilities to form new and more powerful personalities. PLOT: Yukiteru Amano is a 14-year-old loner who observes life and jots down the events on his cell phone. His only friends are Deus Ex Machina, the God of Space and Time, and his assistant Muru Muru. Deus transforms Yukiteru’s phone into a Future Diary, capable of predicting the future up to ninety days. Yukiteru discovers he and eleven others are part of a survival game orchestrated by Deus. The aim of this game is to eliminate the other diary holders, the winner succeeding Deus as god and can prevent the Apocalypse. Yukiteru finds himself protected by Yuno Gasai, a classmate who obsessively stalks him after they promised to go stargazing together a year before. PLOT: After he turns 10 years old, Ash Ketchum (Satoshi in Japan), is allowed to start his journey in the world of Pokémon and dreams of becoming a Pokémon master. On the day he is to receive his first Pokémon, Ash wakes in a panic having overslept. Professor Oak, the local Pokémon researcher, has already given away the three Pokémon (Bulbasaur, Charmander, and Squirtle) he entrusts to new Pokémon Trainers when Ash finally reaches Oak’s Lab. The only Pokémon that he has left is a Pikachu, that he gives to Ash. Determined to make it on his journey, Ash does his best to befriend Pikachu, but it does not trust him and will not even return to its PokéBall, even attacking Ash with its unique electric powers. It is only after Ash protects Pikachu from a group of angry Spearow that Pikachu realizes how much Ash cares, leading it to save Ash. Afterward, they both see a mysterious and unidentifiable Pokémon that spurs both of them to work towards Ash’s goal. PLOT: Tomoya Okazaki is a third year high school student resentful of his life. His mother passed away from a car accident when he was younger, causing his father to resort to alcohol and gambling. This results in fights between the two until Tomoya’s shoulder is injured in a fight. Since then, Tomoya has had distant relationships with his father, causing him to become a delinquent over time. 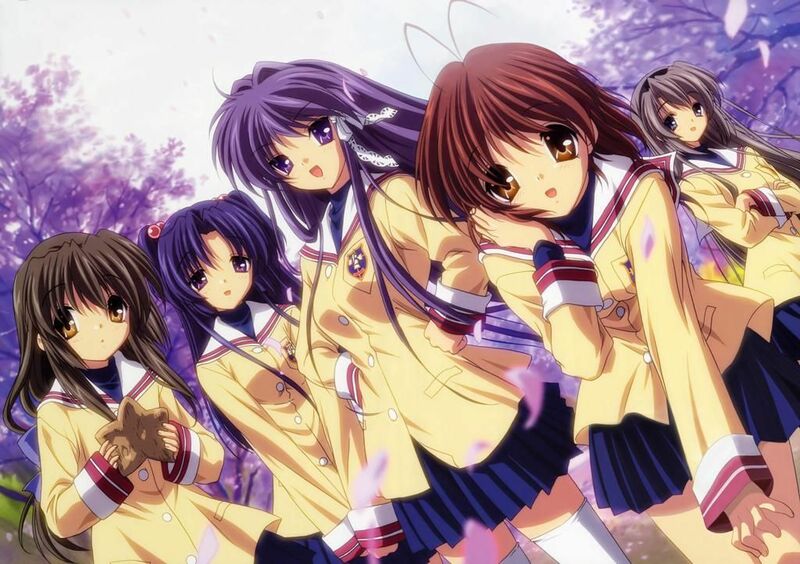 While on a walk to school, he meets a strange girl named Nagisa Furukawa who is a year older, but is repeating due to illness. Due to this, she is often alone as most of her friends have moved on. The two begin hanging out and slowly, as time goes by, Tomoya finds his life shifting in a new direction. PLOT: Piano prodigy Kōsei Arima dominated the competition and has become famous among child musicians but also controversial. After his mother, who was also his coldhearted, abusive instructor that forced him to play the piano emotionlessly, died, he had a mental breakdown while performing at a piano recital at the age of twelve. As a result, he is no longer able to hear the sound of his piano even though his hearing is perfectly fine. Two years later, Kōsei hasn’t touched the piano and views the world in monochrome, without any flair or color. He has resigned himself to living out his life with his good friends, Tsubaki and Watari, until, one day, a girl changes everything. Kaori Miyazono, a fourteen-year old audacious, free-spirited violinist whose playing style reflects her manic personality, helps Kōsei return to the music world and shows that it should be free and mold breaking unlike the structured and rigid style Kōsei was used to, and as she continues to uplift him, he quickly realizes that he loves her. And that’s it for now. I guess I’ll probably make more later on. Previous Previous post: A Future Memoir?